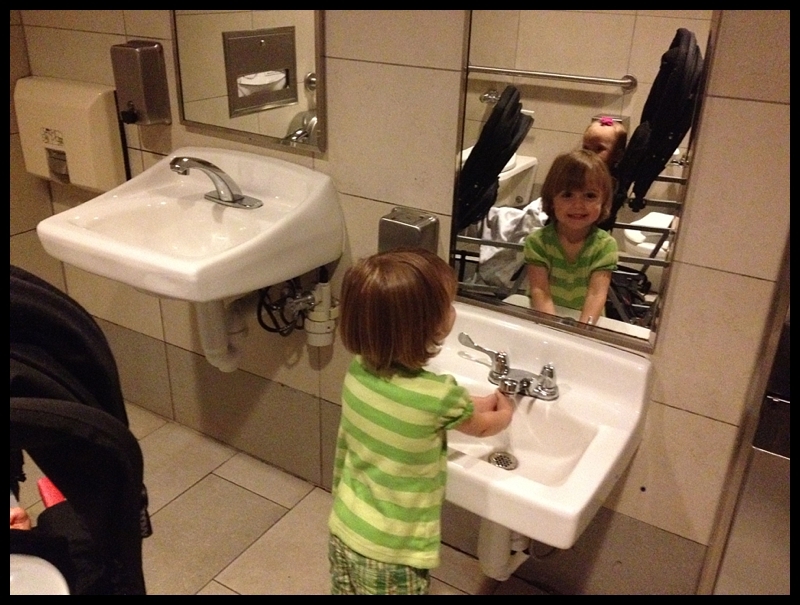 I’m not sure why, but some of our most memorable family outings are in the restroom…Hey, don’t judge! When you have three small girls it is all about divide and conquer; so we have a standing reservation in the Family Restroom! I have VIVID memories of the five of us in the family restroom at our niece’s cheerleading competition…I was in the stall with one of the twins trying to assist her after she dropped half of her coat in the toilet, while Chuck was helping the other twin at the sink – as she sprayed water all over his face. Meanwhile, Bianca had gotten a hold of our umbrella and was using it as a weapon, whacking Chuck in the shin… All of this happening at once, but seeming to be occurring in slow motion. Chuck was trying to hold it together, while holding a child, and reprimanding another; and he looked over at me to see what I was doing to help the situation…and I was sitting in the bathroom floor laughing uncontrollably – wishing I had a camera crew with me to document this MESS that I call my life. That is a PRICELESS memory!!!!! I have to first admit that Chuck and I are the parents that religiously use the church nursery…probably to a fault. When I walk into church and see parents attempting a sermon with their small children in tow, I often question their mental health…But nine times out of ten, theirs are the children that sit quietly doodling on a coloring book that their parents were smart enough to pack. They are the parents who understand that the only way to teach a child to be still in church is to actually take them to church… Yea, Chuck and I missed that memo. Things started on a high note – I mean, yes, my children had destroyed every offering envelope in our pew and one of my girls may have attempted artwork in one of the hymnals…but they were sitting and they were quiet. On top of our good luck, the service began with a video! Score! There is no better way to hold the attention of a toddler! This was the perfect opportunity for Chuck to take all three girls to the bathroom - after all, girls never go to the bathroom alone! So Chuck gave me that look as he headed out the door with three little people STOMPPING behind him…. And about thirty seconds later STOMPPING back in the sanctuary behind him again. This time announcing to the entire congregation, “We can’t go potty, mommy! The door is locked!” Nothing says welcome to Lent like a toilet report from a three-year-old. And while we thought the girls might forget that they needed to go potty, like the five times a day that they regularly forget and have an accident in their Pull-Up, they did not. “M-O-M-M-Y-Y-YYYYYY!!!!! I NEED TO GO POTTYYYYYY!!! !” Brooklynn demanded. This time not pretending to whisper at all. And this time, I decided I should go and assist. So here we were, once again, cozied-up together in the bathroom…Apparently, one of my families’ favorite places to be! And this time, we were in the Men’s Room so there was a urinal involved!